Elegant and simple, the Tyrus Table is the answer to your dining needs! 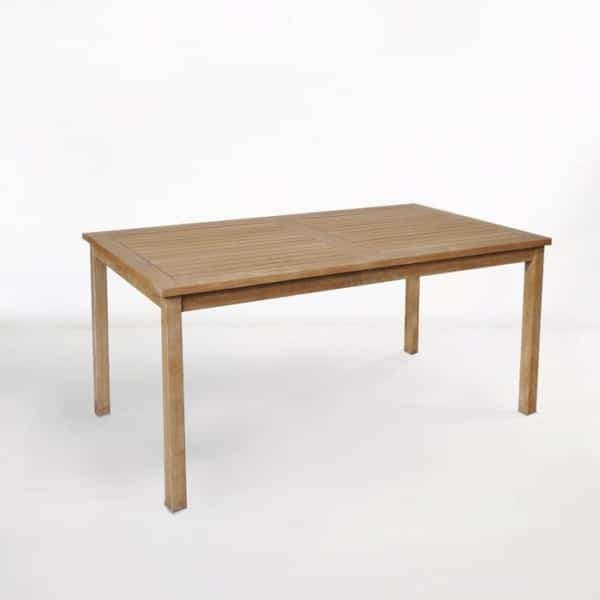 A classic teak table with a terrific and timeless design; the Tyrus Table is a popular model that we’ve had in stock since we opened over 20 years ago! Superbly proportioned, the Tyrus Table features just the right thickness of wood, not too much to go into farmhouse territory but definitely not thin and spindly; this modest and minimal table has a simple frame, with slats of wood running down the piece. The linear structure of the legs are offset by a darling detail underneath the tabletop, adding to its charming and elegant quality. Try this classic teak table in the larger size on your verandah with an Elizabeth Arm Chair and either end and Elizabeth Side Chairs lining the sides for a heavy duty A Grade Teak look. The Tyrus Table also works brilliantly as an indoor table! Place some Sophia Chairs around it and you have a rich, contemporary setting! The Tyrus Table is constructed entirely out of A Grade Teak, the hardiest wood for the outdoors. With incredible levels of natural rubber and oil, A Grade Teak has exceptional durability and resilience against the harsh elements while continuing to look beautiful for years and years! If you have any questions about the Tyrus Table or any of our other magnificent products, call or email us! Our sales staff are ready, willing and on hand 7 days a week to help you find the best combination for your outdoor area!